For Australian conditions Asiatic Lilies are a wonderful bulb, tough, drought tolerant and yet they still provide a riot of colour. These liliums are bred for colour and range from white through to yellows and reds, many spotted and multi coloured. The best time to buy and plant them is in autumn although you can leave it until early spring and they will still thrive. While white asiatic lilies are very popular as cut flowers with so many hybrids available the color range is huge and they are generally speckled. The flowers of Asiatic Hybrid Lilies can be pendant, upward facing (most common) or downward facing and are in general Asiatic Hybrids are not fragrant. Asiatic Lilies range from white through to deep red in colour, are easy to grow and are the earliest to flower. The most popular varieties seem to be the yellow and orange varieties, new varieties have spots, speckles and brush marks. In terms of types of Asiatic lilies, it needs to be remembered that these are hybrids of a number of Lilium species from across Asia. The will flower a little earlier than other types and generally have no fragrance or little fragrance. These are hybrids, and come from a number of species so although they will flower in spring to summer they will in fact flower at different times. 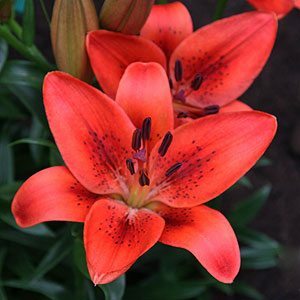 They are grown for colour of the blooms and the form, and are very useful as cut flowers because of the earlier flowering time than oriental liliums. Asiatic and Oriental Liliums are different….. 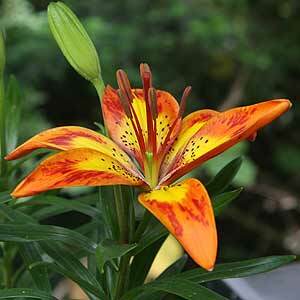 These lilies grow well in a slightly acid soil and prefer a humus rich moist soil. Protection from hot afternoon sun is best. Although we have just said that these bulbs are tough, they will flower more prolifically with a little care. We suggest a well drained soil with some well rotted compost dug in. As they begin to to grow in spring water well with a liquid seaweed fertiliser. As for support, given good soil and enough sun they will usually develop a strong enough stem not to need it. If grown in to much shade they will lean and ‘seek the sun’ and this can cause them to fall over a little. However a garden that experiences windy conditions we do suggest providing some support as with masses of flowers they can tend to get a little top heavy. Although these bulbs are easy care they do require division every 3 – 4 years. They will multiply and become overcrowded causing flowering to be less prolific. Best time to divide is just after the foliage has died back. Asiatic Hybrid Liliums, Oriental Liliums, Perfumed Trumpets, Longifolium x Asiatic (LA cross), Oriental x Trumpet, Dwarf Pot Asiatics and Species Lilium.